News & Photo release archive: Contains all our releases. Video archive: Contains videos in different formats including PAL broadcast video. The latter is furthermore uncompressed and therefore completely uncompromised and unrivaled in quality. 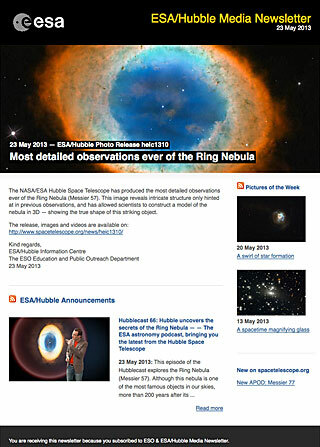 Image archive: Our archive contains all the Hubble images - both American and European - that has been released publicly. The quality of the high-res versions of the images are the best available, and in 97% of the cases completely uncompromised information coming directly from Hubble (without compression and other degradation). Some of the images may seem small (low resolution), but remember that they usually are the sharpest, best and highest resolution images of the given object available anywhere. Note also that nearly all of these images have been used on large posters, banners in sizes up to several metres (and even house-size in some cases). Embargo Mailing List: ESA/Hubble makes science and photo releases available to bona fide journalists around 48 hours before publication. A URL and password is circulated to our embargo mailing list whenever new releases become available. To subscribe please fill in the form below. NB: Only for members of the press. We recommend that members of the press join either the embargo list described above or our public Hubblenews e-mail subscription list. This list notifies interested persons whenever interesting News and Photo releases go public.